The vice principal of a major Chinese medical university has been put under investigation for severe violations of discipline and the law, a byword for corruption, recently, one in a series of anti-corruption enforcement actions against medical institutions that have been involved in the shady trade in human organs. Xiao Yuping was the vice principal of China Medical University, a large medical research institution in the city of Shenyang, Liaoning Province, in northeast China. The announcement of his downfall was made by the Central Commission for Discipline Inspection, the Party internal control organ, on May 12. No details of his alleged infractions have been published, and it is unclear whether hospitals that have been involved in the human organ trade are specifically being targeted for investigation, but Xiao joins a growing number of senior medical administrators to be removed from institutions that had their fingers in a bloody business that the current leadership, under Xi Jinping, has gone some ways to publicly disclaim. According to the World Organization to Investigate the Persecution of Falun Gong, a research group based in the United States, China Medical University was involved in the harvesting of organs from Falun Gong prisoners of conscience, including during the period when Xiao was deputy head. Falun Gong is a traditional Chinese spiritual practice that has been persecuted in its homeland since 1999. The use of Falun Gong prisoners as organ sources is all done with courts involvement. A WOIPFG report of Aug. 7, 2012, shows that China Medical University cooperated on a research project on organ transplantation recipients after drug injection, led by Wang Lijun, then director of the Public Security Bureau of Jinzhou City in Liaoning Province. The project is strongly suspected of using organs sourced from prisoners, according to WOIPFG analysis, given the number of tests conducted and the limited availability of non-prisoner human organs in China. In 2012, Wang was taken down as part of the purge of former Politburo member Bo Xilai, and charged with abuse of power, bribery, and defection, and sentenced to fifteen years in prison. A second indication of China Medical University involvement in illegal and unethical practices comes from a secretly recorded investigative phone call made by WOIPFG, and released on May 25, 2012. The call features Chen Rongshan, director of Urology at the Jinzhou Military 205 Hospital, saying that the use of Falun Gong prisoners as organ sources is all done with courts involvement. He also said that the China Medical University cooperated with his institution in some of their organ transplantation work. There are a number of similar cases where the heads, or leading members, of medical universities that were involved in the organ trade have been purged. On Aug. 3 last year, Party investigators announced that Wang Guanjun, president of the First Hospital Of Jilin University, also vice president of Jilin University, was under investigation for serious violations of discipline and law. 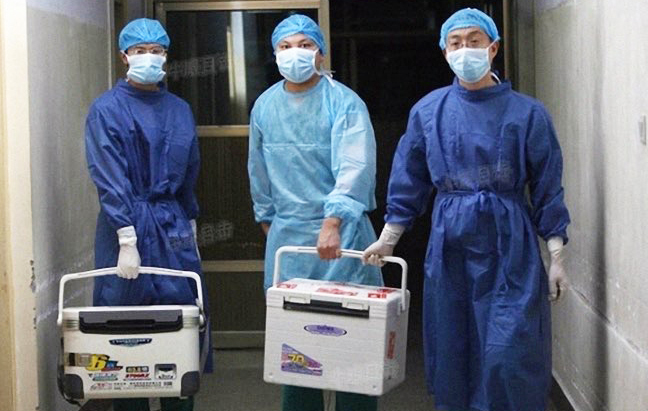 The First Hospital of Jilin University is understood to be a major organ transplant center. According to Minghui, a Falun Gong website which carries primary reports on the persecution of the practice in China, the First Hospital performed over 20 organ transplants within two months, from April to May 2006, with only two organ sources identified. The rest sources were of unknown origin, the report says. From July through September 2006, the hospital also performed seven or eight kidney transplants per day—much more frequent than mere voluntary donors would allow. Chinese authorities themselves admit that upwards of 90 percent of organ transplant operations in the country have come from executed prisoners, and say they are working to reform the system. “Based on the information the WOIPFG has received, we have plenty of evidence to show that Jilin University and its hospital heavily participated in the persecution of Falun Gong,” said Wang Zhiyuan, the spokesperson for WOIPFG, in a telephone interview with the New York-based NTD Television. “Especially after Wang Guanjun served the position, the First Hospital of Jilin University was severely suspected to be involved in the organ harvesting of Falun Gong practitioners. We believe that Wang Guanjun is responsible for the practice,” Wang Zhiyuan continued. Another purge of a medical administrator from a hospital suspected of illicit conduct was that of Hu Tiehui, former vice president of the Central South University in the city of Changsha, Hunan Province, who was investigated for corruption in August of last year. The Xiangya Second Hospital, and the Hunan Medical Science University, both of which Hu served at, became a major part of the organ transplantation industry in and around Changsha. Apart from medical universities, top officials at hospitals that have been involved in organ harvesting have also been purged. The Supreme People’s Procuratorate, for instance, on April 27 announced a case against the former president of the First People’s Hospital of Yunnan Province, Wang Tianchao. The announcement says that Wang abused his power and received up to 80 million yuan (nearly $13 million) in bribes, and that he held around 100 real estate properties, 100 parking spots, and more. Whether the investigation of Wang has anything to do with the hospital involvement in the organ business is unclear. The First People Hospital of Yunnan Province is listed as one of the major liver and lung transplantation hospitals in China, according to the website of the National Health and Family Planning Commission. And it is also listed as one of the 26 hospitals in Yunnan suspected by WOIPFG of being involved in the harvesting of organs of Falun Gong prisoners. Many of the hospitals and medical universities in China that have been probed by Party investigators recently are believed to have traded in organs from prisoners of conscience. Another hospital in Yunnan, the Third People Hospital of Yunnan Province, is also listed in the WOIPFG report. Its former president Yang Zhan was sentenced to five years in prison in 2012 for taking bribes, according to state news reports. The recent investigations of hospital and medical university staff come during a climate of apparent official rejection of the policy of harvesting organs from prisoners. This policy shift has not been codified in law, but Huang Jiefu, the chief of the Chinese transplant apparatus, has said that no more use of prisoner organs will take place during his tenure, and explicitly blamed the policy and its attendant abuses on Zhou Yongkang, the former security chief. In an interview with Phoenix Television, Huang called the practices filthy. Separately, a retired military surgeon blamed Xu Caihou, a deposed former military leader, for the participation of military hospitals in organ harvesting, and said that some areas began engaging in live harvesting, meaning that organs were removed from the victims before they were dead. No Chinese official has acknowledged that Falun Gong practitioners or other prisoners of conscience, including Uyghur Muslims, are among those killed for their organs. An interview with Ethan Gutmann, covering organ harvesting in China and the state of the media.